Move oven rack to lowest position. Heat oven to 400°F. Lightly grease bottom and side of springform pan, 8x3 inches; remove bottom. Mix cracker crumbs, pecans, 2 tablespoons sugar and the butter. Press about 3/4 cup of the crumb mixture evenly on bottom of pan. Place on cookie sheet. Bake 6 to 8 minutes or until golden brown; cool. Assemble bottom and side of pan; secure side. Press remaining crumb mixture 2 inches up side of pan. Cut 11-inch circle of heavy-duty aluminum foil. Place pan on foil circle; press foil up side of pan to prevent dripping in oven during baking. Place white baking chips in 2-cup heatproof glass measure. Place measure in 1 1/2-quart saucepan. Add water to saucepan until 2 inches deep. Heat over low heat, stirring frequently, until chips are melted. Remove measure from saucepan. Beat melted chips, 3/4 cup sugar and the flour in large bowl with electric mixer on medium speed until blended. Beat in cream cheese and egg yolks until smooth. Continue beating, adding the eggs one at a time, then the sour cream until blended. Pour batter carefully into crust. Cover pan with aluminum foil. Turn off oven and leave cheesecake in oven 15 minutes. Cool on wire rack 15 minutes. Run metal spatula along side of cheesecake to loosen before and after refrigerating. Cover tightly and refrigerate at least 8 hours, but no longer than 5 days. Run metal spatula along side of cheesecake to loosen; remove side of pan. 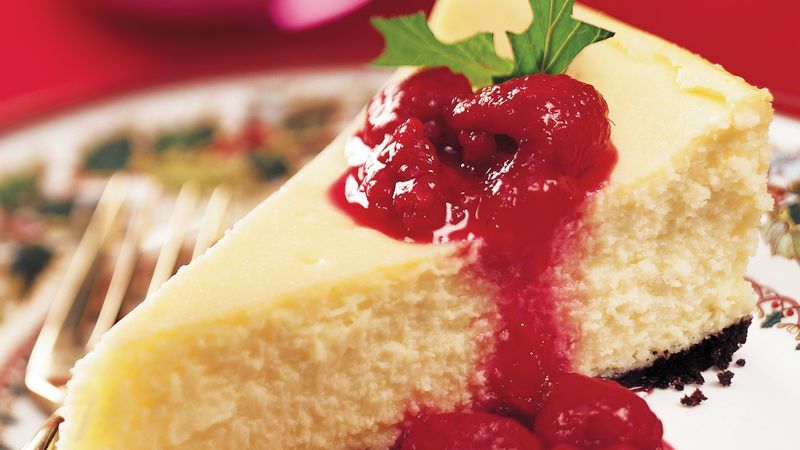 Place cheesecake on serving plate. Top with fruit. Immediately refrigerate any remaining cheesecake after serving. Make your dessert a star with carambola! The unusual star-shaped carambola fruit makes an excellent garnish for this dessert. Simply wash and slice carambola, pat it dry and let your stars shine! Toasting brings out the flavor of the pecans. To toast nuts, sprinkle them in an ungreased heavy skillet. Cook over medium-low heat 5 to 7 minutes, stirring frequently until browning begins, then stirring constantly until golden brown.